Just a generation ago, common wisdom held that once a person reaches adulthood, the brain stops producing new nerve cells. Scientists countered that depressing prospect 20 years ago with signs that a grown-up brain can in fact replenish itself. The implications were huge: Maybe that process would offer a way to fight disorders such as depression and Alzheimer's disease. This year, though, several pieces of contradictory evidence surfaced and a heated debate once again flared up. Today, we still don't know whether the fully grown brain churns out new nerve cells. This year's opening shot came March 7 in a controversial report in Nature. Contradicting several landmark findings that had convinced the scientific community that adults can make new nerve cells, researchers described an utter lack of dividing nerve cells, or neurons, in adult postmortem brain tissue (SN Online: 3/8/18). A return volley came a month later, when a different research group described loads of newborn neurons in postmortem brains, in an April 5 paper in Cell Stem Cell (SN: 5/12/18, p. 10). Scientific whiplash ensued when a third group found no new neurons in postmortem brains, describing the results in the July Cerebral Cortex. Still more neuroscientists jumped into the fray with commentaries and perspective articles. This ping-ponging over the rejuvenating powers of the brain is the most recent iteration of a question that still hasn't been answered. The first encouraging news about brain cells came in 1998 when scientists looked at the brains of people who had been treated with a compound that marks DNA in newly born neurons. The compound turned up in cells in the adult hippocampus, a brain structure important for learning and memory. Those results, along with a 2013 study that used a different tagging method, suggested that the brain can pump out neurons throughout life. Despite the more recent negative results, many scientists still hold on to the notion that new growth happens. "The [negative] findings were very controversial," says neuroscientist Sandrine Thuret of King's College London. She and colleagues argued in a July 5 review in Cell Stem Cell that the latest evidence isn't strong enough to abandon the idea that the human brain can produce new neurons. "It's always very difficult to put aside a phenomenon just by not finding it," Thuret says. 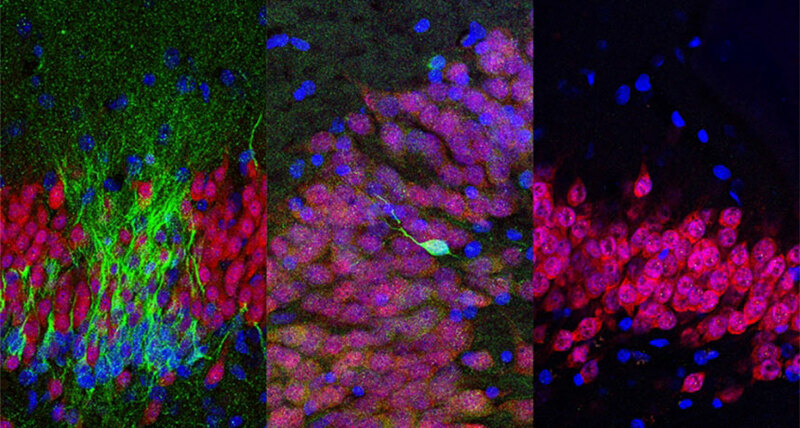 Part of the trouble is that there aren't good ways to measure neuron birth, an elaborate process called neurogenesis. To get a glimpse of the process in humans, studies have relied on postmortem tissue, which is finicky, delicate and idiosyncratic. Small differences in methodology or disputed cell identities could explain the opposite conclusions, Thuret and others suggest. "Let's face it," Thuret says. "It's not easy to label and detect adult neurogenesis in human postmortem tissue." Such studies offer only a snapshot in time, obscuring much of the active birth process. What's more, "there's a huge variability," in tissue quality and in donors' health status, she adds. Those differences may also explain why researchers don't agree. Despite these discrepancies, this year's studies "provide a push to the field to develop more advanced tools and models," Thuret and a colleague wrote in June in a commentary in Trends in Molecular Medicine. Shawn Sorrells and Mercedes Paredes, who reported finding no new neurons in Nature, agree that new methods are badly needed. "We hope that this renewed debate sparks new efforts to creatively study the human brain," the two University of California, San Francisco neuroscientists wrote in an e-mail. New methods that quantify active genes in single cells may ultimately provide a more precise way to identify newborn neurons. Other experimental techniques, such as lab-grown brain organoids (SN: 3/3/18, p. 22) or sophisticated brain scans, may also help. If researchers could pinpoint a proxy for neurogenesis, such as a signal in the blood or cerebrospinal fluid, then the process could be studied in living people. Meanwhile, some researchers are sprinting ahead to ask how neuron growth could be harnessed to improve health. No one disputes that adult mice make new neurons. In combination with a compound called BDNF, boosting neurogenesis in mice with signs of Alzheimer's improved their mental skills, scientists reported September 7 in Science. If people, like mice, can make new neurons as adults, then perhaps a similar boost could ultimately protect against - or even reverse -Alzheimer's and other neurodegenerative diseases. But as this year's news has shown, that's a big if.